Glasses aren’t the only apparel on Google’s bill of fare. The search giant has already proven its appetite for wearable computing objects — to much ado — with Google Glass, Sergey Brin’s pet project stirred up out of the experimental “Google X” wing of the company. But at South by Southwest this year, the company is going a foot (or two) further in wearables. Google showed off a “talking shoe” for the first time at the Austin tech and culture event, an aptly named hybrid of silicon, sneaker and sass. 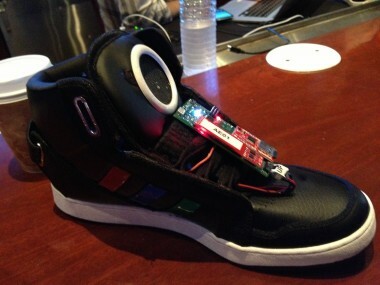 It’s very much a prototype design, with a massive conical speaker slapped onto the shoe’s tongue, and a host of about 250 phrases that the small computer spits out at you, depending on differing factors, including whether you’re stationary, walking, running or just ambling along. An accelerometer, gyroscope and pressure sensors are embedded within the shoe itself, so it’s constantly measuring how much activity you’re exerting. Developer Leif Percifeld, from interactive startup company and Google partner YesYesNo, told me that the project stemmed from the thought that perhaps not only could an “inanimate object have a personality of its own,” but that it could push out that personality to other social networks, essentially a form of broadcasting your activity to Google+. It’s also a sort of thought experiment in the advertising space, Percifeld said. The project came from a collaboration between Google, YesYesNo, ad agency 72andSunny and Adidas, with the aim of bringing the idea of advertising to multiple creative forms, including the everyday objects around us. Let’s be clear: Siri for shoes, it ain’t. It literally has a slab of chip strapped to the laces — not exactly as fashionable as the Adidas of yore. And again, it’s not going to be doing much except say one of those randomized, prerecorded phrases contingent on how much you’re moving around. Fun? Perhaps. Practical? Not so much. Though really, it wasn’t it meant to be. It’s Google’s fun toy to show off at South By, really a way of proving a point; wearables, connected devices and the Internet of things are on Google’s menu. Keep your eye out for more.